Two Great Programs To fill your Stocking With! Legacy Winter Recreational & Advanced Development Programs NOW REGISTERING! 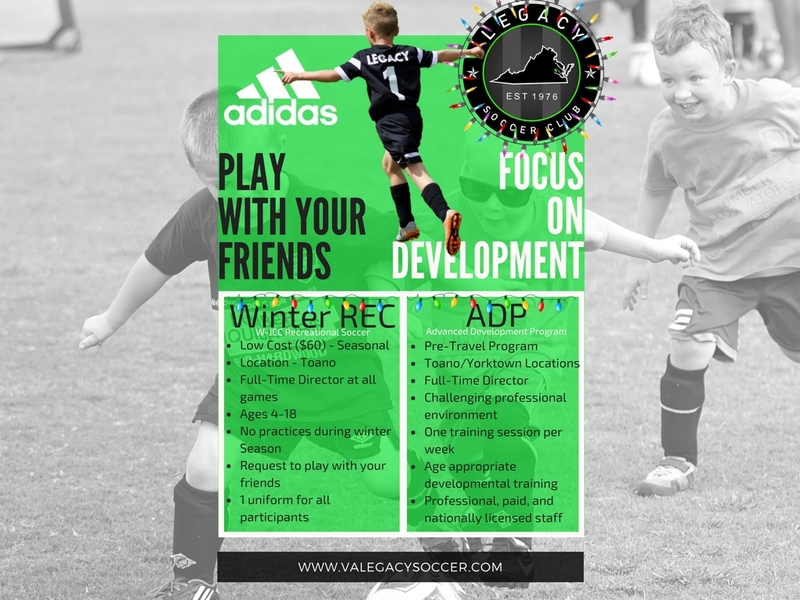 The Virginia Legacy Winter Recreational program is an excellent opportunity to keep playing during the winter without too much commitment. A perfect opportunity to play the game in an enclosed venue despite the temperature! Each player signed up is guaranteed one game each Saturday (times determined by age). This program does not have practices. Volunteer coaches with the support of Director Kendal Pressey – Email Director Kendal Pressey (Kendal@valegacysoccer.com) if you would like to help coach or earn your coaching license (all licensing paid for by club). Our winter program exclusively uses a futsal ball for all games. The Futsal ball is a special, thicker ball, with reduced bounce to improve the touch and control for the player indoors. All players are guaranteed playing at least half of the game, if not more due to roster sizes. The Legacy Winter Recreational program fields small sided games (small court like field) increasing the likelihood of touching the ball and being involved in almost every moment of the game. Game times are published a week prior to the first games (Youngest players play in the morning and oldest in the afternoon.) Games are usually very fast and high scoring. Each player will be given one uniform shirt to be wore on each weekend. All players must wear shin guards, socks that cover the shin guards and athletic shoes that are not cleats. All players are encouraged to bring their own water. Game Dates | January 6, 13, 20, 27, February 3, 10, 17. 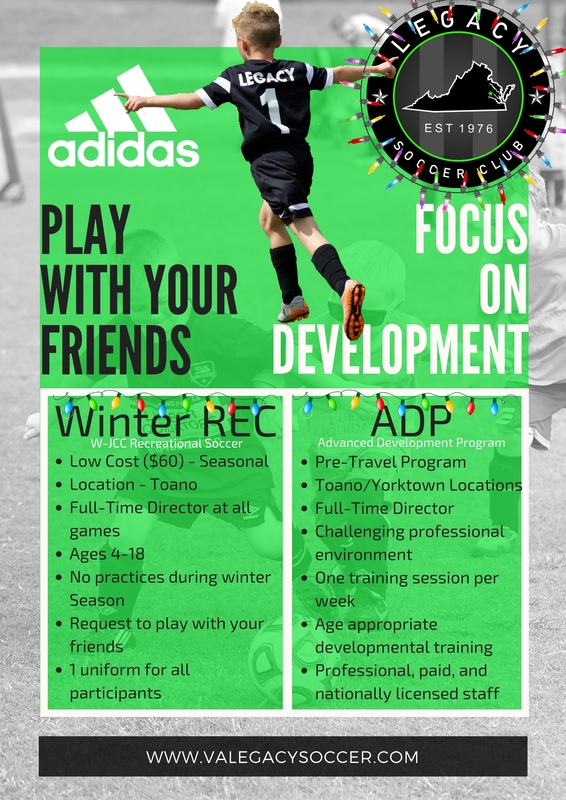 The ADP winter program provides one training session and one game day a week, for 7 weeks (Training day determined by location.) All games played on Saturday mornings during the 7 weeks season are performed at the Premiere Sportscenter Yorktown. Each training session will revolve around the player and their ball. Individual technical skill is what we are working on this winter. Most training sessions will involve a lot of technical training balanced with small sided games (1v1, 2v2). Training will end with scrimmages (4v4). All training sessions will be run by Nationally Licensed Coaches who have been licensed by either The United States Soccer Federation or the National Soccer Coaches Association of America. The Younger Group (2012 + 2011) will be pooled together and formed into different teams each weekend to provide the staff the ability to make sure the game experience is beneficial to all participants. After teams are formed, the age group will then play several small sided games during their time slot. The Older Group (2010 + 2009 + 2008) will be formed into teams prior to the start of the season and will compete week to week on an established schedule that will be distributed prior to the first game. All games and much of practice will be played with a Futsal Ball (A heavier, thicker ball, that has reduced bounce as well as developmentally improves a players touch.) – Weekend Schedules TBA. Yorktown Premiere Sportscenter (106 N. Constitution Dr. Yorktown VA 23692). Each participant will be designated to one training night a week at your selected location. Click here for more information about the ADP program.